Just a few days before the theatrical release of " National Treasure: Book of Secrets", Walt Disney Home Entertainment is releasing the film that started all "National Treasure" In a two disc Collector's Edition DVD available on December 18, 2007. The Collector’s Edition DVD includes a wealth of bonus material including four new featurettes that take viewers inside the making of this family classic, plus a sneak peek at the highly anticipated theatrical sequel National Treasure: Book of Secrets. The well acclaimed and blockbuster 2004 movie, National Treasures continues to delight fans. Coming from a family of treasure seekers, Ben Gates (Nicholas Cage) is out to find a treasure hidden by the founding fathers. However, this task would seem close to impossible as his employer Sean Bean (Ian Howe) wants a piece of the legacy and becomes Gates' biggest obstacle in the chase for the grand prize. When Gates blows the whistle that the map to the treasure is behind the declaration of independence, the race against villain, Bean begins. But Gates is not alone in this quest as Abigail Chase (Diane Kruger) and Justin Bartha (Riley Poole) become his wise allies in decipher the encrypted clues and keeping the declaration of independence safe. The movie has such an interesting imaginative plot and quite complex dialogue that there is no doubt that Disney wanted to target their middle school age fans and adults as well. While toward the middle the movie, it tends to drag from one clue to the next, it is the two stunts what saves the scenario. One is the cave in stairs and the other is a car chase. The acting is very good typical of Nicholas Cage and Jon Voight who plays Patrick Gates. Adding humor is the nerdy Riley Poole, who continues to show great potential for a leading role. In addition to the original DVD extras, National Treasure: Collector’s Edition includes a treasure trove of new bonus features. The new featurettes including "On the Set of American History," "To Steal a National Treasure," "Exploding Charlotte" and “Ciphers, Codes and Codebreakers” accompany additional 5 deleted scenes with introductions by the film’s director , Jon Turteltaub (Phenomenon). A special preview will prime audiences for the all-new sequel, National Treasure: Book of Secrets. 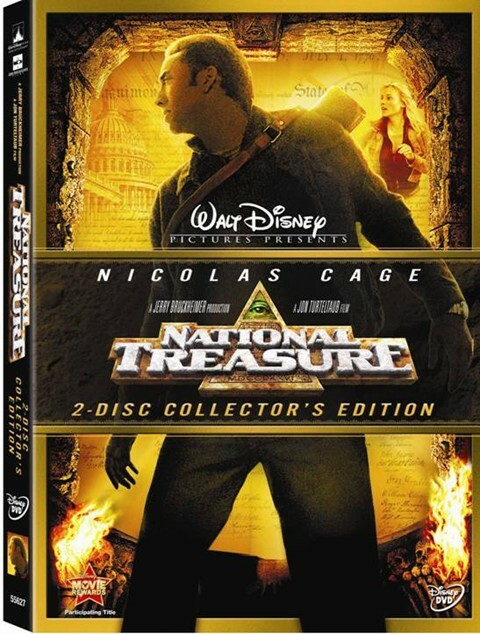 Overall National Treasure: Collector’s Edition is a nice addition to the DVD collection and it accomplish it mission of getting everybody in to the treasure hunt mode.